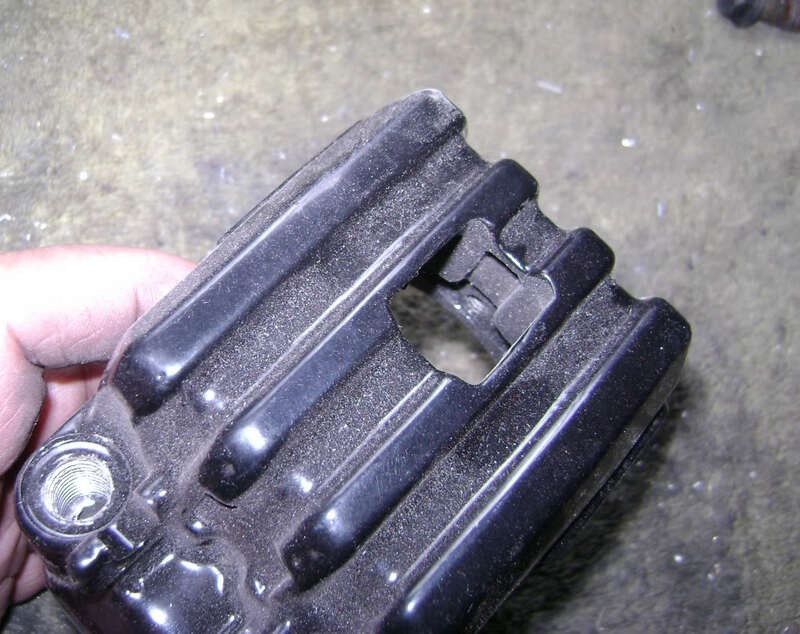 Checking/replacing brake brake pads can be a regular item if you ride a lot, or maybe you just got a 'project' bike and need to see what you have. For detailed info on actually removing/replacing the pads, refer to your service manual. Here's some details the manual doesn't cover or cover well. Here's the three pad types you'll run into on the XS/XJ bikes. Left to right, you have all standards (F&R) and Special rear (except LH), Special front (except LH) and LH/XJ rear, and LH/XJ front. 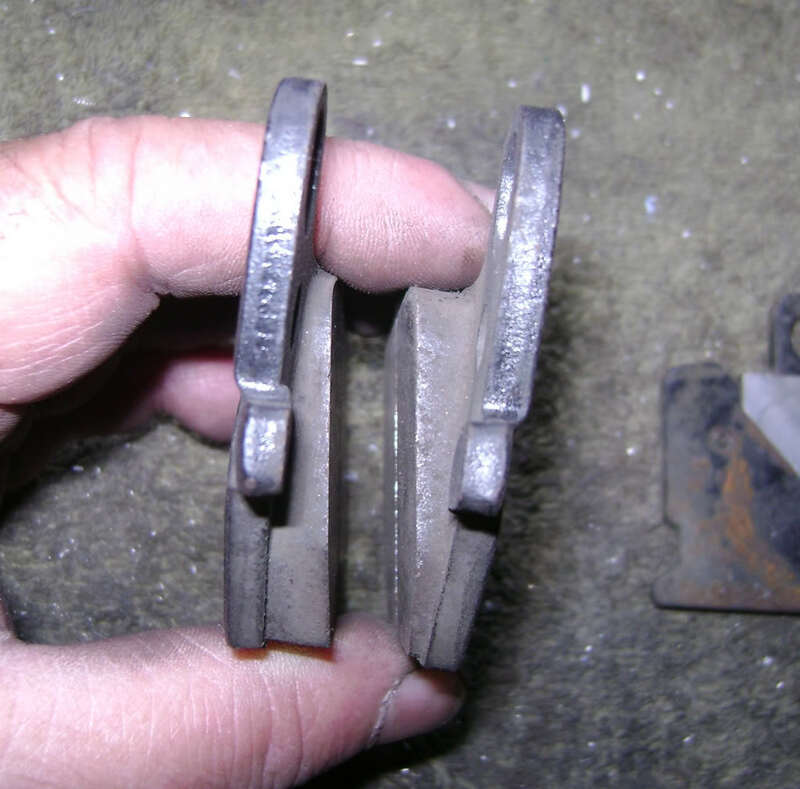 The standard and LH/XJ front pads still have the factory shims. Note the 'bumps' on the Special pads; these pads don't fit flush in the caliper, but ride on these bumps and don't use shims. 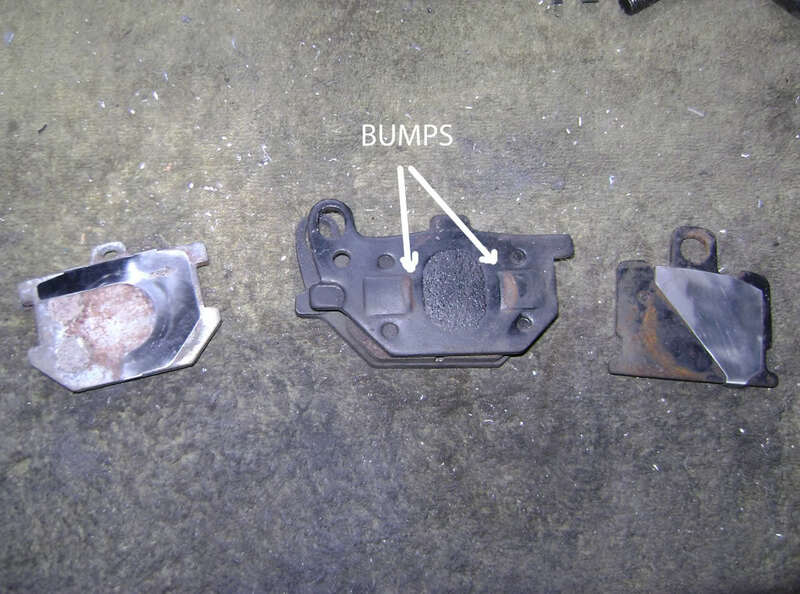 The bumps allow the pads to 'roll' a bit, allowing for slight misalignment of the caliper. The shims are usually missing, don't be concerned it they are. 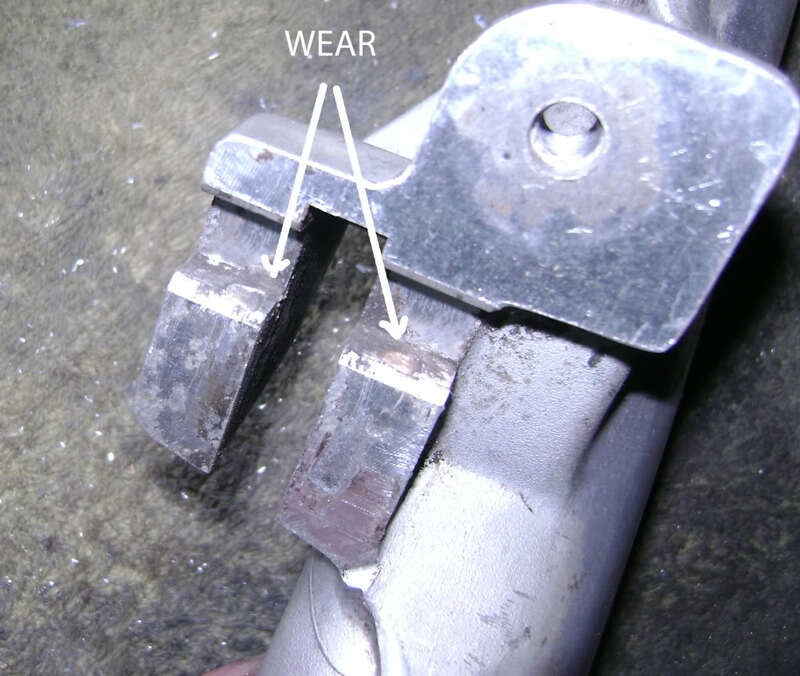 Note that the shims are directional; these are supposed to be installed against the caliper piston if present. The shims are no longer available but if you would like to make some, the original material is .015" stainless steel. Yes, this taper is normal! This Special front and LH/XJ rear set is near new; if they're worn, the taper will be less. These pads are side specific; there's a left and right side. Looking from the end with the hole for the retaining pin, this is a right side set; the left side will be tapered opposite. The two 'tabs' you see in the middle of the backing plates are the wear indicators; if these get close to or touch the rotor, time to replace. The 'window' isn't installed here, but will be a small plastic bit snapped in with a cover that lifts. and the LH/XJ fronts and rear; on the Special fronts, these clips fit on the forks. These are where the pads actually transmit the braking force to the mounts and if they're missing the pads can wear grooves in the aluminum mounts. 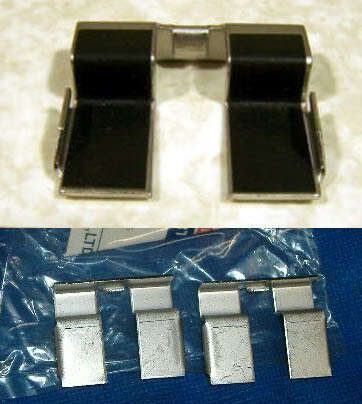 This is a particular problem with the Special fronts and LH/XJ rear pads, as these seem to go missing the most. The one shown on the LH/XJ rear mount in the pic was hand-fabricated as these are no longer available. This is why this is a problem; without the retainer, the pads will wear these grooves as seen (these aren't too bad... yet) and when you replace the new pads will want to fall into these grooves. This can cause uneven pad wear and dragging brakes. This is what the 'Special' retainers are supposed to look like. The black on the back is two-sided tape to help retain them. 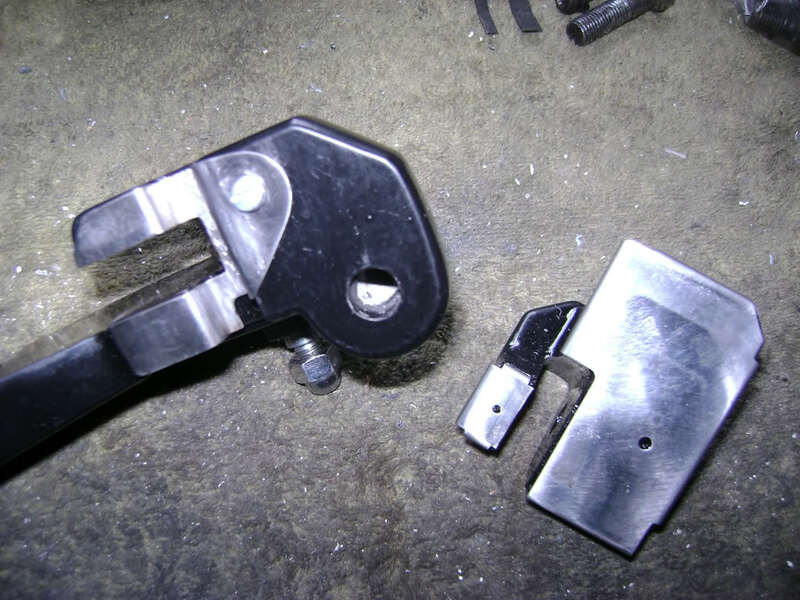 One last item; when replacing pads, you'll need to push the caliper piston back in. If the piston doesn't go in fairly easily, you need to rebuild the calipers! If a c-clamp with a lot of pressure is what it takes, stop there! Corrosion, rusted pistons are the main reasons they won't push in, and you may be risking more damage by forcing it.